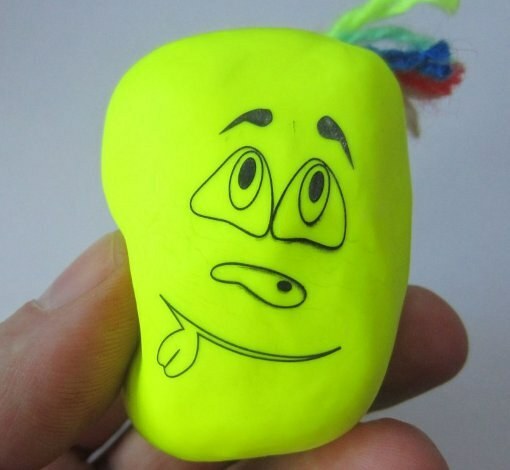 Many remember toys, which are easily crushed without losing their shape, they were the progenitors of anti-stress toys - funny, bright, with a funny face. To make such "Kapitoshka" you can with your hands. In order to make the toy "Kapitoshka" need a normal balloon. It is better not to save and acquire more robust, or later all the stuffing of the toys will be on the floor. You can use a single ball, but for greater strength it is better to take a couple, then investing in one another. Then, you should insert a funnel. But her neck is narrow enough to work with him will be uncomfortable, so the toy is better to do with a plastic bottle. For this cut from her bottom and the neck pull on the tail. Next task is to fill a future toy. For this you can use baking flour, sand, cornstarch or talc. Here all will depend only on your imagination and the age of the child, because if the bulb is broken, and the child is still very young, he is required to taste the contents. When the bulb is full, you firmly establish its tail, cutting off if necessary the excess. Next is to start decorating is to draw a nose, eyes and smile. This can also be done using colored paper. On the other hand you can just buy the ball with a ready painted faces. When a person is ready, you can think about the hair "Kapitoshka". You can make them using wool yarn, Christmas rain, etc. Toy Kapitoshka ready. She is an excellent trainer for the development of children's motor skills, and for adults can be an excellent tool for stress relief. However, the described method not only to create a "Kapitoshka" with their hands. For those who know how to hold a needle, you can make a fun toy for your baby. The more that skill is not required. For this you will need a piece of burlap round shape. It should be collected on a thread so that happened in the end pouch. As a filler suitable sintepon, foam or hollofayber. In addition, you can use non-standard materials: flowers, leaves, cereals or grass. Depending on the filler, toys can be a variety of functions: it can be aromatic, normal, or developing fine motor skills in children toy. On the bag need to embroider mouth, eyes and nose. You can then start making pens, you can make them with corks from wine bottles, having them pre-opening. The rope is fed through the filled pouch, then pass through the tube and tied into a knot.